Of course, this list doesn’t begin to include the countless seamless improvements and innovations we’ve added to our Plotting/Cutting systems over the last 20 years. While the Plotter/Cutter and software are new and improved, the existing Phillocraft steel frame table we sold Strong in 1994 was still in great shape. Our Phillocraft tables are built to last! 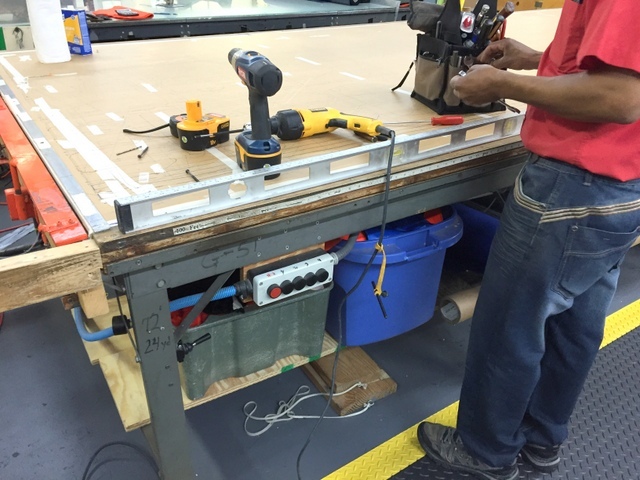 We simply removed their our original track system, re-leveled the table, and replaced it with 78′ of our new Supertrack. 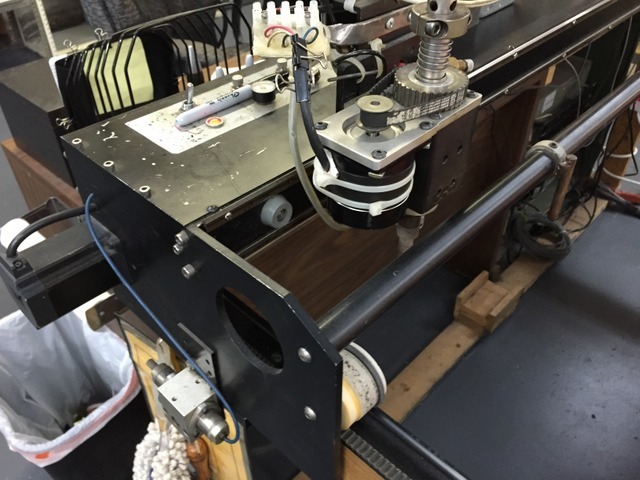 Carlson Design PT-78 Plotter/Cutter on a 76′ long Phillocraft vacuum table with hot knife tool attachment. That’s a LONG 76′ long table! Look at these precise, clean panel cuts – beautiful. 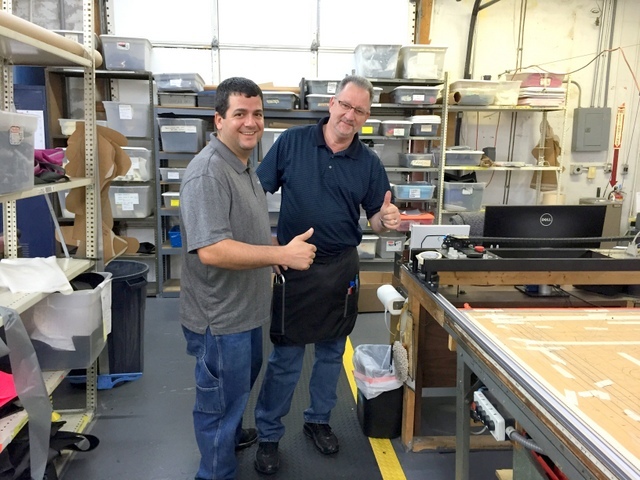 Director Mike Rinaldi and operator Jim give a “Thumbs up” next to their new PT-78″ Plotter/Cutter. Strong’s new system is faster and more simpler than ever. It also uses affordable and reliable off-the-shelf components, making service and maintenance easy to perform in-house. We’ve been very busy making BIG improvements over the last 20 years! Below, we’ll take a closer look at both our software and hardware improvements. We overhauled Strong’s legacy Plotmaster software suite with our all new Plotmaster USB, called PMU. PMU now connects through USB allowing it to run on any Windows PC (7/8). PMU integrates nesting, editing, and Plotter control into a single easy-to-use program. It makes network file sharing simple, has a robust universal *.DXF importer, all-new autonesting algorithm, and features improved CAD file optimization. To test the impact of our new optimization software, we ran a time study on one of their more popular existing files. Cutting the same pattern, at the same speeds as before, the new optimized path shortened cut time by 3 minutes — 19 minutes not optimized vs 16 minutes optimized. That’s more than a 15% improvement from the click of a button! And that’s just from optimizing. 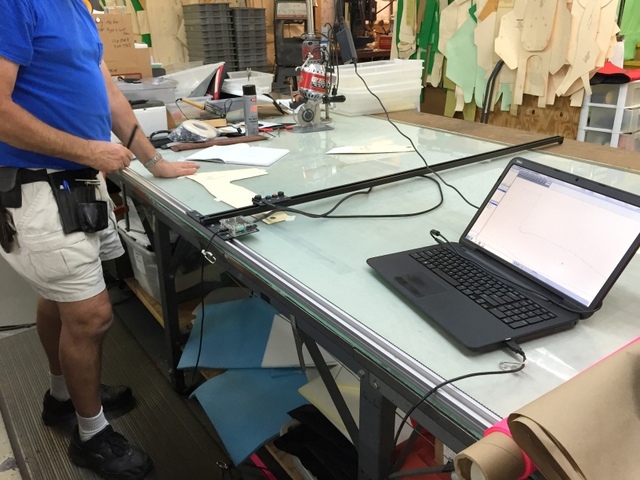 We also added a new autonesting software, NestFab, which offers improvements in speed and material yield. NestFab’s algorithm quickly finds the most optimal layout. This maximizes material yield and saves many hours previously spent manually nesting. 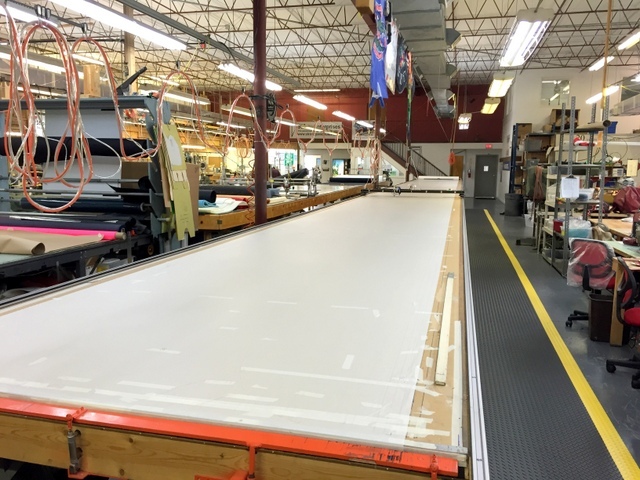 On a 76′ long vacuum table like Strong’s, the time and material savings adds up very quickly. Autonesting saves a lot of material and hundreds of hours of nesting time. New “Group” import – which allows them to import multiple objects from a single *.DXF pattern. These *.DXF improvements make it easier to draw patterns, organize files, and manually nest. These little changes add up to big time savings. 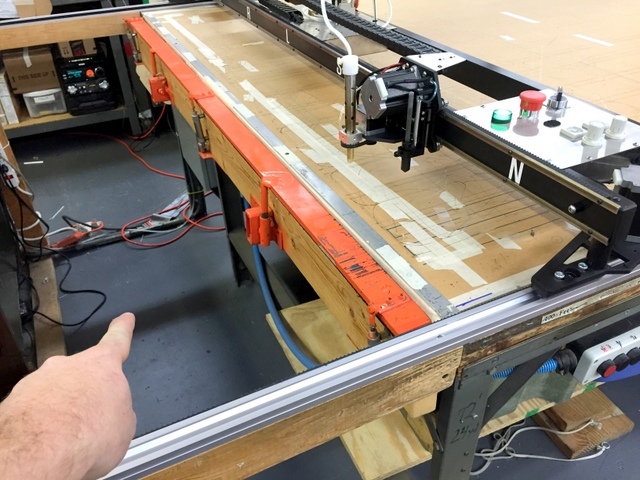 Our 2015 PT-78″ Plotter/Cutter may mount on the same 76′ long vacuum table as their 1994 Pro-78 Plotter/Cutter, but the hardware is by no means the same. The 2015 PT-78 rides on an all new track system, features a totally redesigned hot knife tool attachment, and has all new controls that greatly improve the operators’ user experience. The result is an machine that is up to 10X faster, and much easier to use. 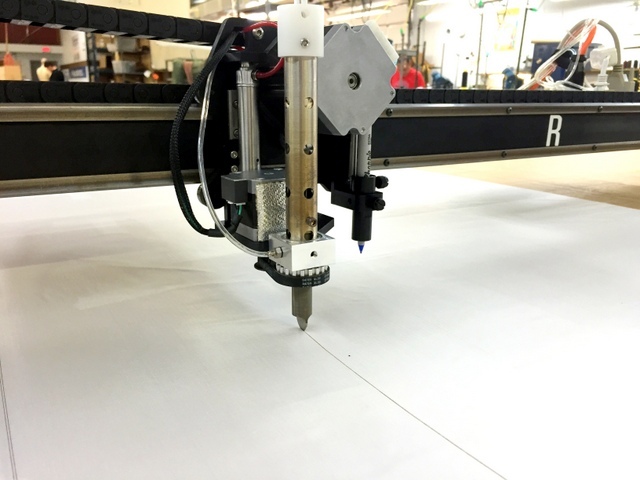 Our new captive track system allows the Plotter/Cutter to Plot, Cut, and Traverse at much higher speeds without stalling or racking-out-of-square. 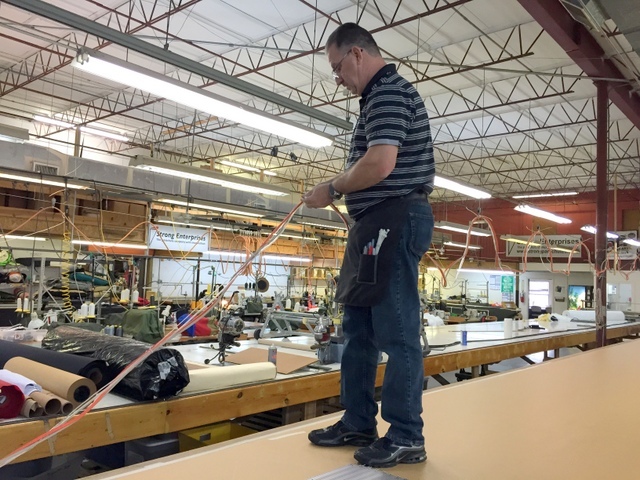 Jim: Expert Plotter/Cutter operator of 17 years — loves the new improvements. Some of our biggest speed gains came from our new track system. The old Pro was limited to plotting, cutting, and traversing at a slow 5 inches per second (IPS). Our new PT-78, riding in our new captive aluminum track system, can Plot at 30 IPS, traverse at 50IPS, and thanks to our redesigned hot knife tool attachment, can heat seal at an amazing 3X faster 15 inches-per-second. The time savings of traversing from point to point (when the pen and cutter are lifted) will save hours, not minutes, every single day. The hot knife tool attachment mounts in place of our standard magnetic mount blade holder. Switching between the hot knife and rotary blade cutter takes about 2 minutes. Anyone who has used a hand-held hot knife knows that there is a fine balance between making a fast cut and a clean cut. If you go too fast the blade won’t cut. Too slow, the material burns or throughput suffers. Computer controlled hot knives make it much easier to find the sweet spot of both speed and accuracy. Our Hot Knife 2.0 (HK2) has a sharp, hot blade and runs at an steady speed with pneumatically controlled pressure. It is 5X – 7X faster than Strong’s original hot knife and exponentially faster and more accurate than a hand-held cutter. 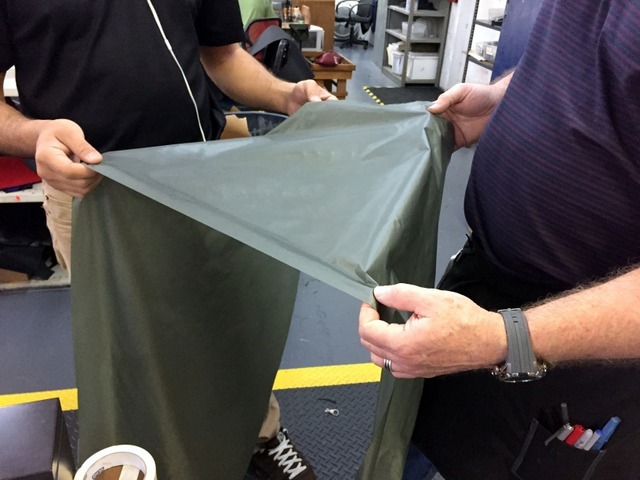 To further limit heat dissipation, Strong uses a heavy 40 lb butcher paper cutting surface instead of a galvanized sheet metal cutting surface. They report better vacuum hold, longer blade life, and a cleaner and faster cut using the paper cutting surface. In fact, they made the switch before converting to the HK2, and found the paper allowed their old Plotter/Cutter to cut 2X faster than on metal. The burn rate is surprisingly slow when both heat and cutting pressure are properly set. Eventually the paper will get grooves, tears, and burn spots – however it can then be flipped for use on the other side. An additional advantage is that the paper, unlike metal sheeting, has no seam lines that could trip up the hot knife head if not fully flush and level. 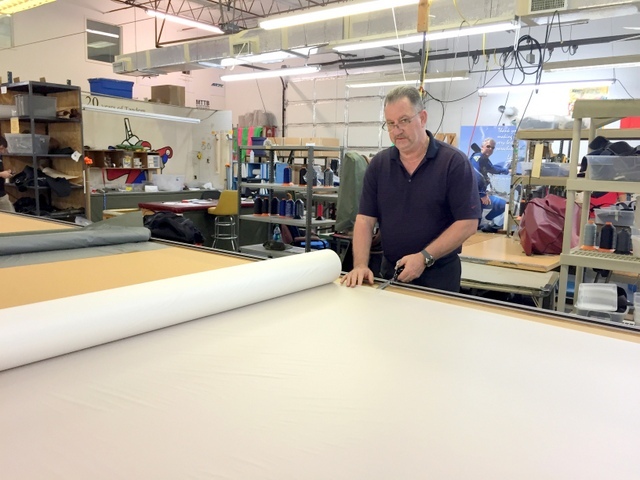 40 lb Butcher paper is used as a consumable cutting surface instead of a metal or plastic cutting surface. Strong reports it to be durable and they get better cuts than using a sheet metal top. Strong’s regenerative vacuum blowers pull a vacuum through the paper cutting surface. 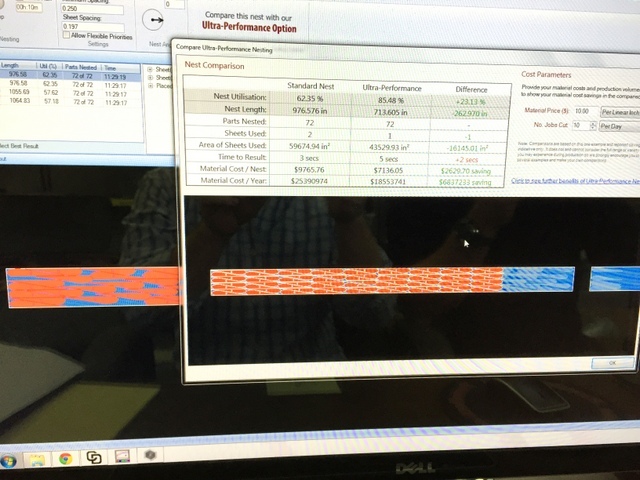 With our improved track system and the new HK 2.0 hot knife we saw speed gains on every material they cut. Cordura to parafoam – 2 ply. Was 1.7IPS now almost double the speed cut at 3IPS. Thumbs up – Looks clean! 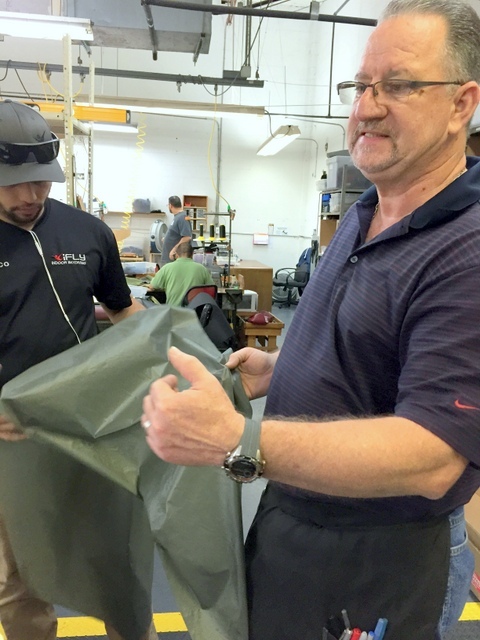 For many of their fabrics they will cut more than one ply. They use this technique to increase throughput and, in certain circumstances, “seal” two pieces together until they can be sewn. Multiple layers are cut quickly, with a sealed edge. In addition to speed improvements, changes in our hardware over the last 20 years have resulted in an improved user experience. The Plotter/Cutter’s tool head is now mounted on the back-side of the machine, allowing the operator to see and align the head from his workstation. The air tools no longer drop when the machine is turned off and there are now two large emergency stops on either side of the gantry, enabling the operator to easily terminate a plot/cut. These changes wouldn’t be obvious to new customers, but they make a BIG difference to our 10, 15, and 20 year legacy operators. Once you experience the difference, you won’t know how you ever lived without these improvements. Longer tables are more efficient. You can layout more parts, or layout all common parts for a single job. 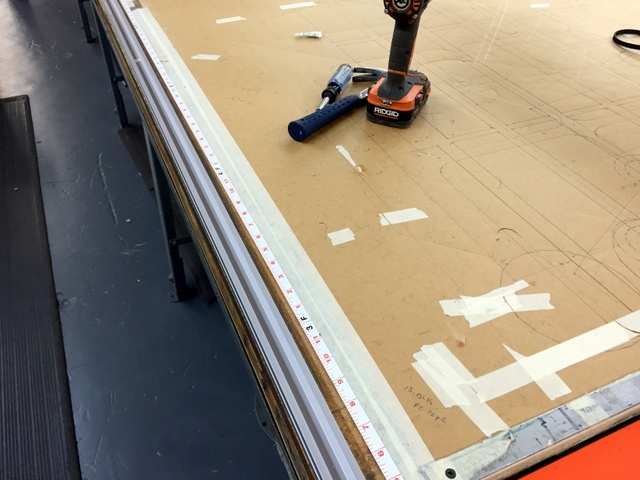 A 76′ long table means they don’t need to break the patterns required to make a single chute onto multiple tables. Certain orders require hundreds of identical parts that do not require a sealed edge. 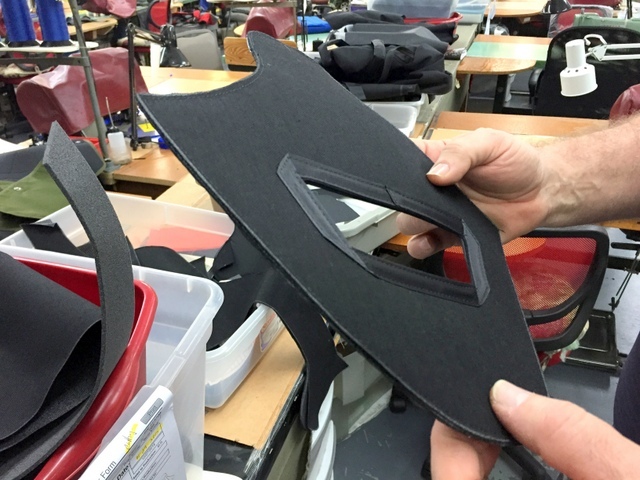 These can be stack-cut with their hand-held reciprocating cutter. 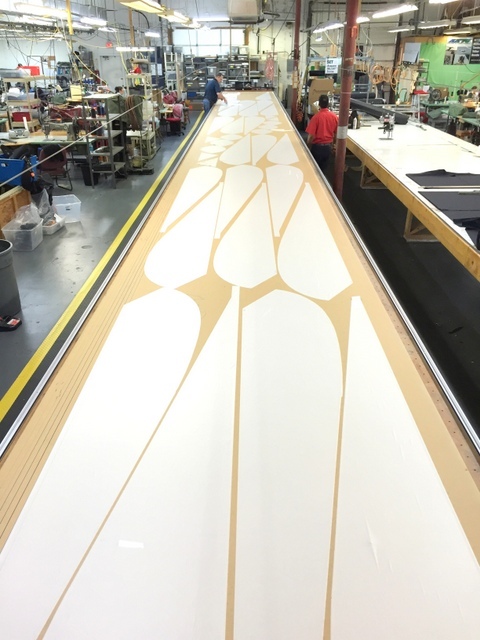 To maximize material yield and layout time, they use their Carlson Design nesting software and Plotter to create a pattern marker that can be placed on top of their multi-ply stack. 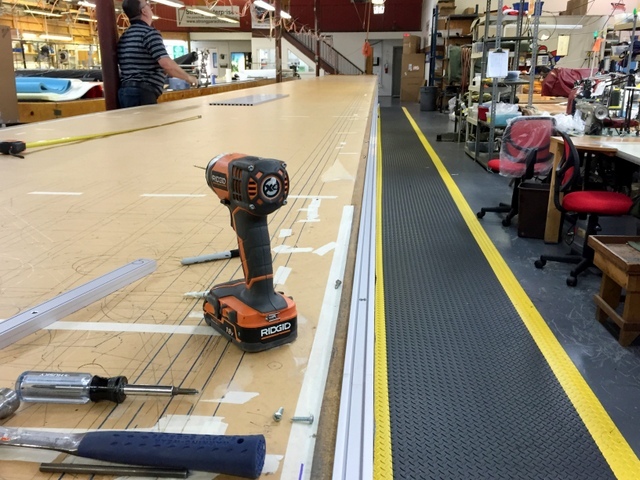 Pictured: The Carlson TeamWork Plotter/Cutters. Two identical systems working on the same table, on the same job, doubling throughput and reliability. 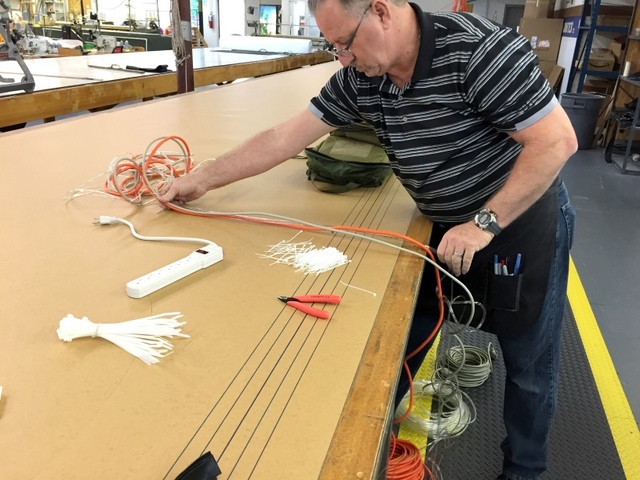 To “future proof” their installation they purchased the Carlson Design Teamwork package. This system allows them to add a second gantry to their table at anytime. 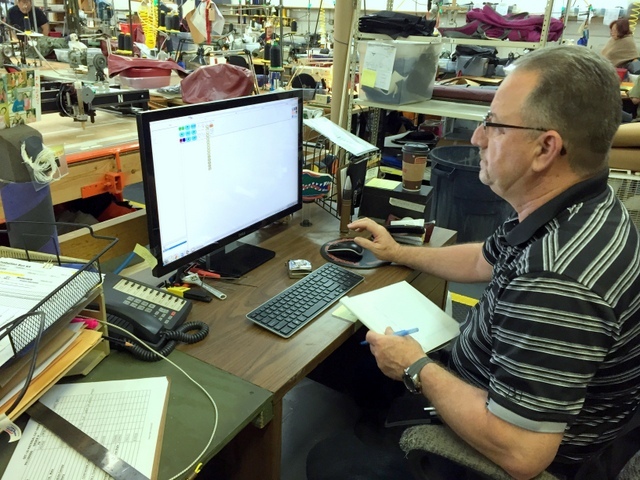 The two systems ride on the same table and work on the same job — split by our Collaborator software package. A job can be shipped to both Plotter/Cutters from a central computer to on-board Windows 8 tablets that independently control each system. This allows them to double their throughput, without doubling their foot-print. Installing the second system is fast, easy, and affordable. 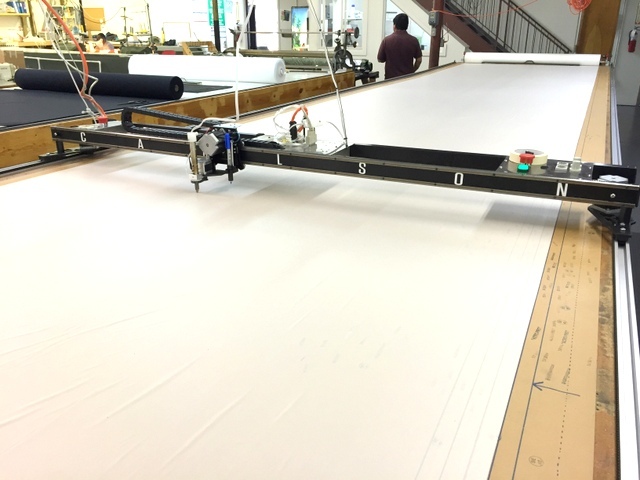 When Strong Enterprises upgraded their Plotter/Cutter they also added our T-Bar Pattern Digitizer. 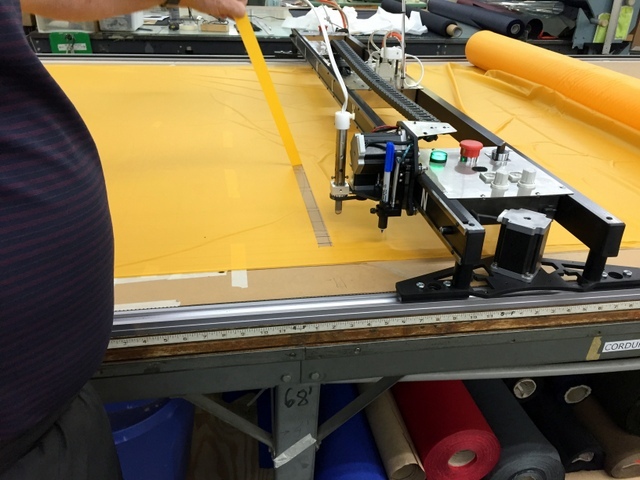 This is simple pattern digitizer will further ensure their Carlson Plotter/Cutter is an invaluable addition to their operation. The T-Bar Pattern Digitizer allows Strong to trace their existing paper pattern library, adding even more functionality and versatility to their Plotter/Cutter system. 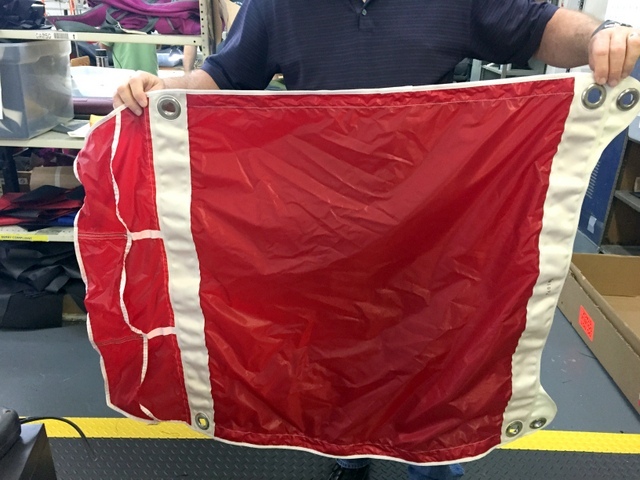 Therefore, in addition to cutting parachutes, their Plotter/Cutter can easily cut bags, harnesses, and any other apparel or canvas item associated with parachuting. The T-Bar Digitizer uses the same Plotmaster software suite as the Plotter/Cutter. 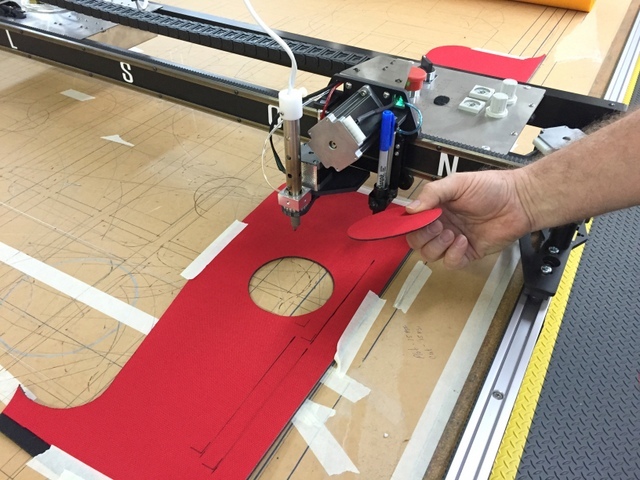 It can ride in the same track as the Plotter/Cutter OR can be mounted on a separate table. 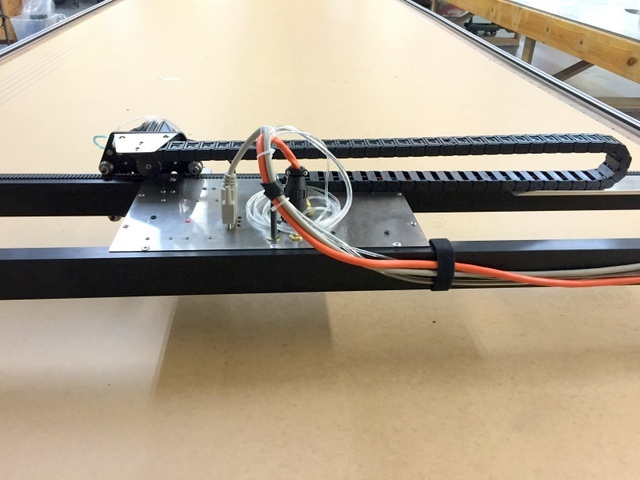 The T-Bar Digitizer can ride in the same track as the Plotter/Cutter, providing a digitizing bed the length of the table. 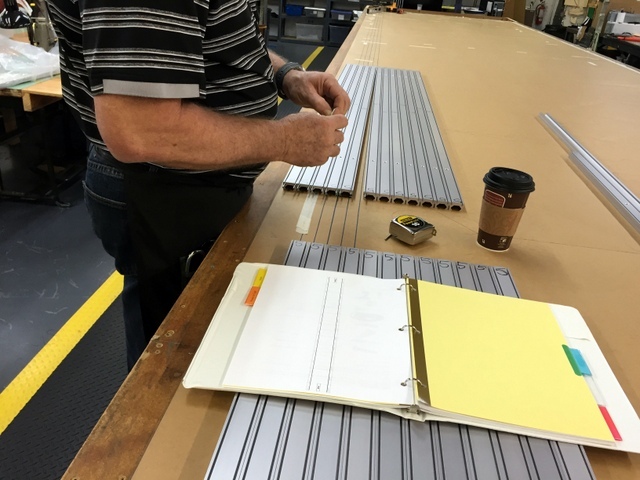 Strong uses their Plotter/Cutter vacuum table continually for production, so they purchased an additional 20′ of track to mount the T-Bar on a separate table. The T-Bar uses the same Plotmaster software suite as the Plotter/Cutter, meaning there is NO learning curve. They installed PMU on a laptop they can place near the T-bar when digitizing. The hardware and software setup at Strong Enterprises makes for a very impressive marking and cutting system. Below, we will detail how they upgraded their system, design choices, and basic operating technique. 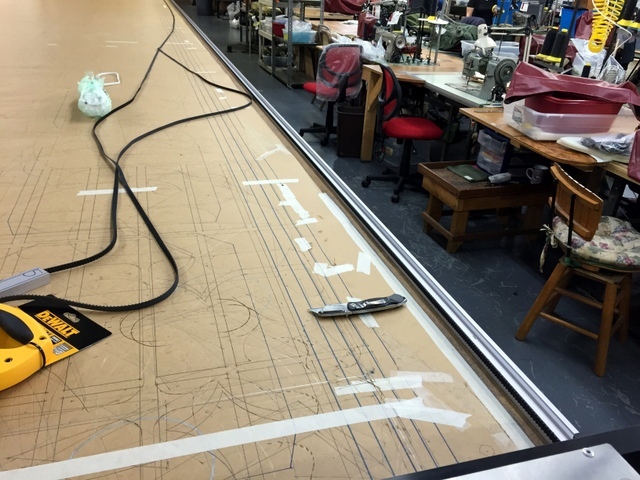 They are cutting on a 76′ long Phillocraft vacuum table. This table is over 20 years old and still holding up great. To upgrade their system we simple removed their old track and cabling, re-leveled the table, and attached our new track and cabling. They purchased 78′ of track, so that the last two feet hang past the leading edge of the table. This way, the hot knife can park over the table, placing the hot tip of the blade out of the way of any table, paper, or material. In addition to being a safe place to park the system when still hot, but unattended, it’s also ideal for changing the blade even when it’s hot. The extra track and open area is perfect for parking the hot knife in a safe area. 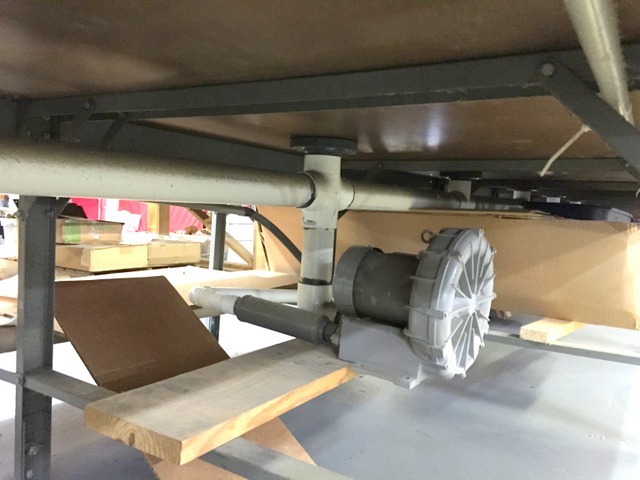 They also installed a pneumatic clamp to quickly hold the leading edge of their material. When upgrading your Plotter/Cutter system, a little prep before the system arrives will go a long way to ensuring a speed installation. We recommend clearing the old track and then leveling table the day before you expect to install. This is relatively easy to do and will limit your down time. First, unpack your Plotter/Cutter shipping box and confirm everything has arrived in one piece. Layout the track according to the track guide. Loctite the track pins. Loctite takes 10-15 minutes to setup, so it’s best to do this step first. Before installing the track, confirm the table is level. 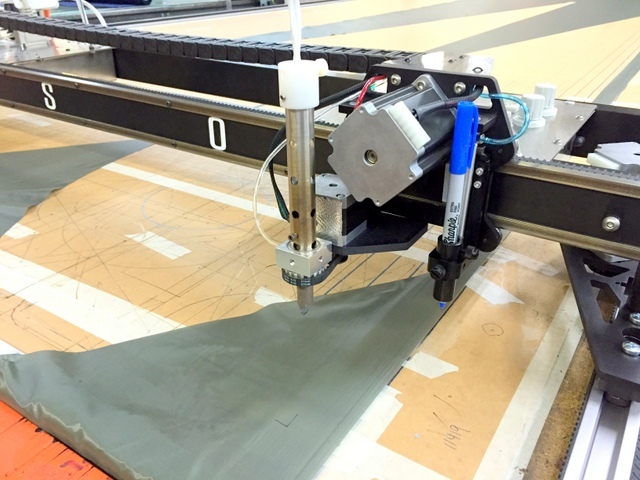 The more level the table, the faster, smoother, and more reliably your Plotter/Cutter will run. Connect your control, power, and air cables together. Place a ziptie every 18″-24″. Make sure the air hose does not get pinched or bound. Strong Enterprises removed their existing overhead cable and we attached the new cable in its place. We recommend using a quality marine-grade pulley every 4-5′. Attach track side A. 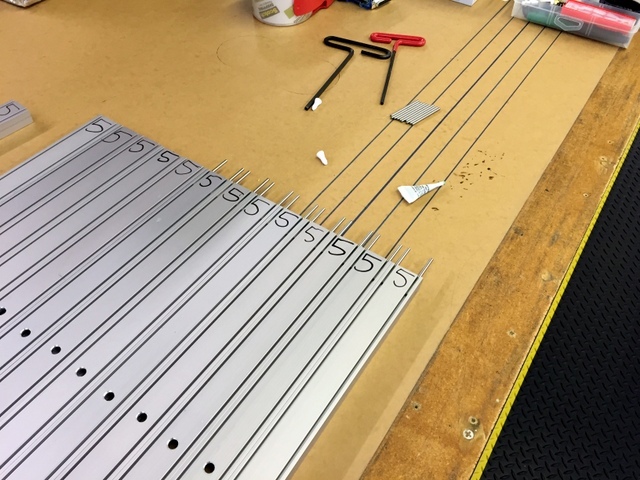 Lay the track down the length of the table and then Loctite and pin it together. It is very important to alert everyone near the table NOT to touch the track. You do not want it to be accidentally dropped off of the table. Align as straight as possible. Attached the track with the screws provided. Drill a pilot hole and screw by hand. Screwing by hand will prevent you from over tightening. Clean the track belt. Prepare the back of the track belt to be taped to the track by rubbing it down thoroughly with acetone. Attached the track belt to track side A with double sided tape. When attaching the belt, apply with even pressure. Attach track side B. Layout and pin as straight as possible. Slide the track carriages into side A and B and adjust them to glide smoothly down the track when vertically loaded. 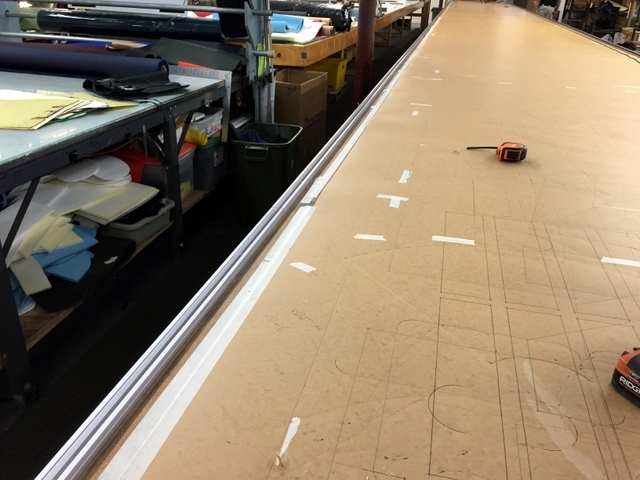 Place the plotter/cutter gently on the track carriages and securely attach them. 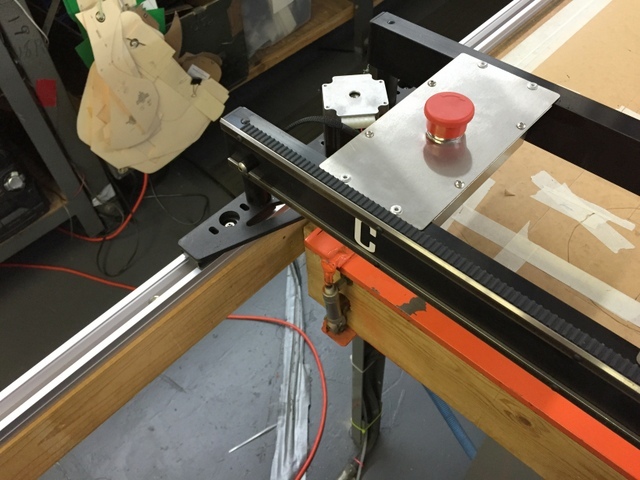 Square the machine and then use the machine as a jig to keep the track square. 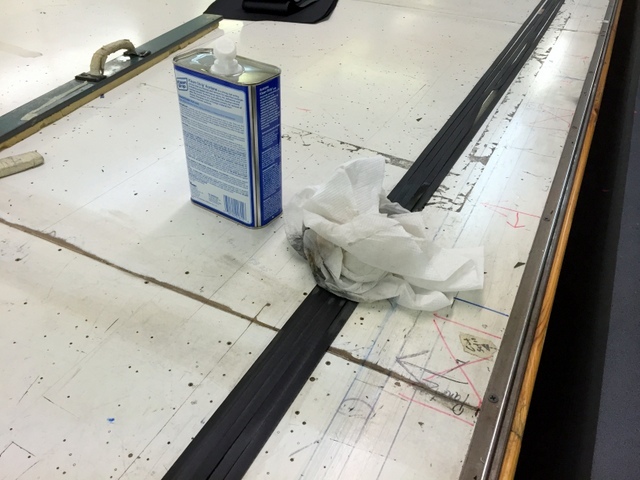 To keep the system square on a 78′ long table, we recommend running a long tape down track side A and B. 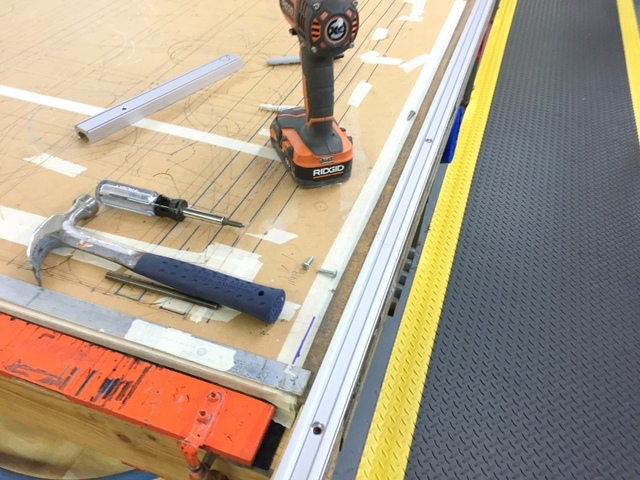 Drill and screw the track to the table as you advance the Plotter/Cutter. Attach the overhead cabling to the center panel of the machine. 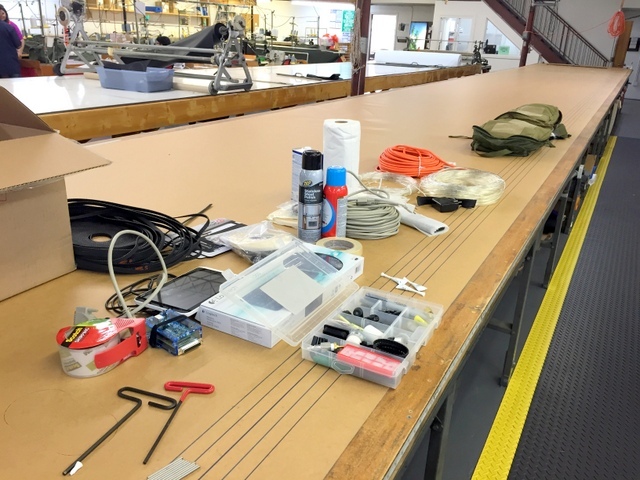 Use the 3D printed clips or velcro provided to secure the cables to the back-side of the machine. 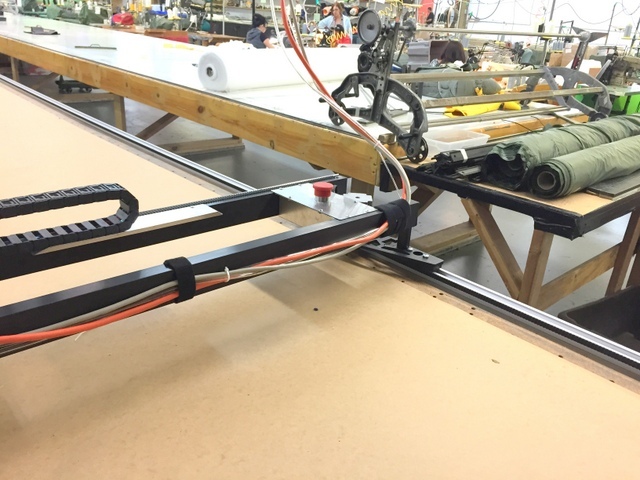 Run Bungee cord from the Plotter/Cutter to the overhead cable to prevent overloading your control, power, and air cables. You will need some paper or scrap material you can mark on to calibrate and square you Plotter/Cutter. It is important you do this before running production panels to ensure accuracy. Anyone who has used Plotmaster — in any form over the 20 years — will find the latest version of PMU familiar, yet streamlined and much improved. Our new PMU combines Plot/Nest/Edit/ and Patterning into a single, tab-based program that is intuitive and easy to use. No computer experience necessary! 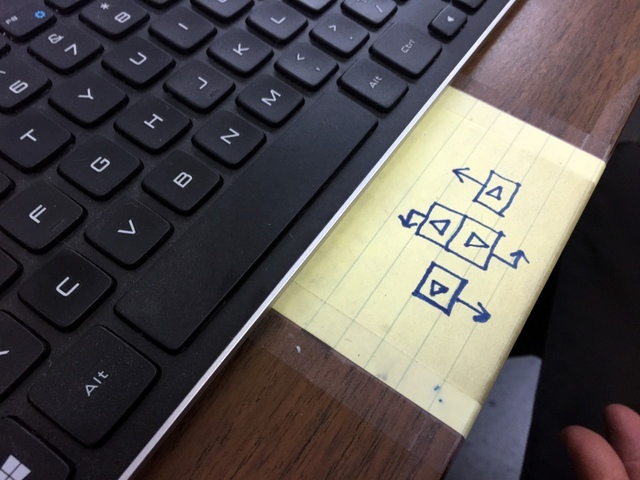 They used a little note card to help them remember which keyboard keys jogged the machine which way. 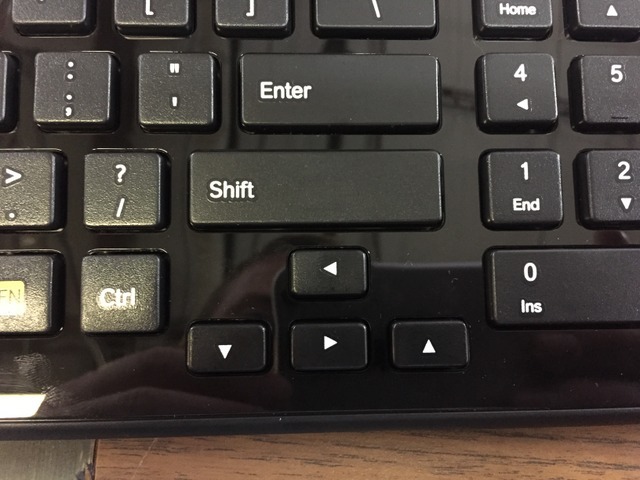 Using a small screw driver we were able to rearrange their new keyboard to match their existing work flow! When you start cutting with the hot knife tool attachment, it is a good idea to run a series of test cuts to determine the correct speed to get the best cut quality for each different material. These speeds can be recorded and saved in our software or in the back of you manual. Checking out Strong’s great looking final products. This logo was cut using the Plotter/Cutter! 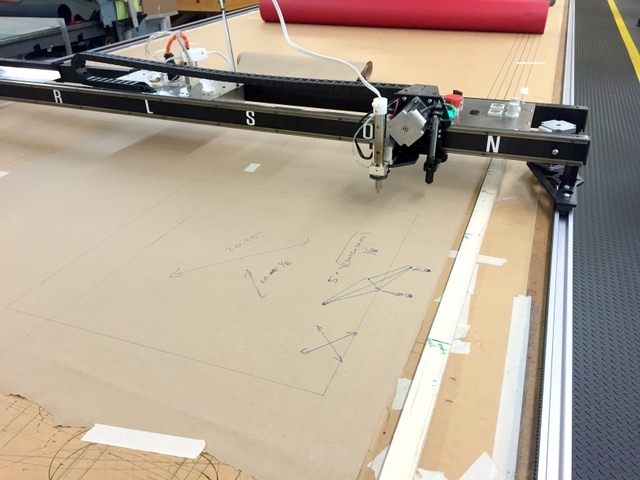 Unique canopies can be created using CAD and the Carlson Plotter/Cutter. This canopy was made specially for an up coming trade show. What a great looking product! 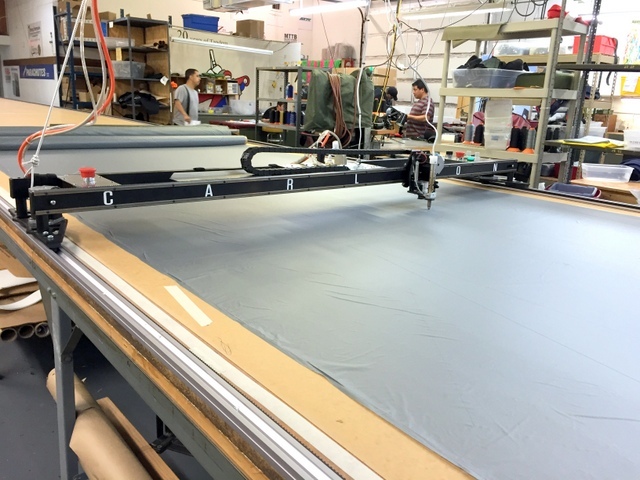 Products other than parachute panels can be quickly and accurately cut on the Plotter/Cutter. 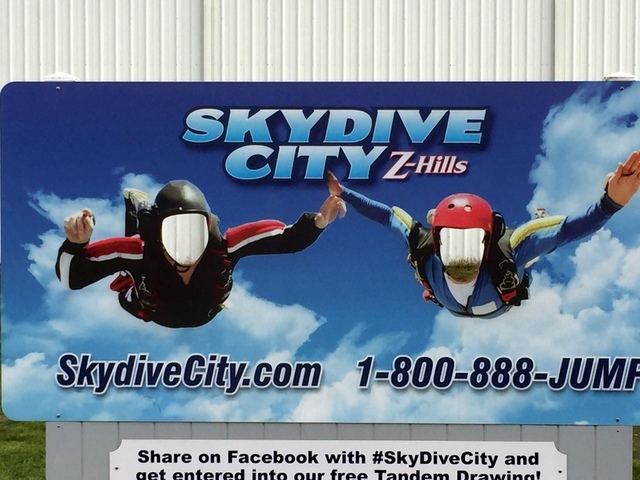 On the final day of our install they offered to let us try one of their world class parachutes and jump out of a plane. 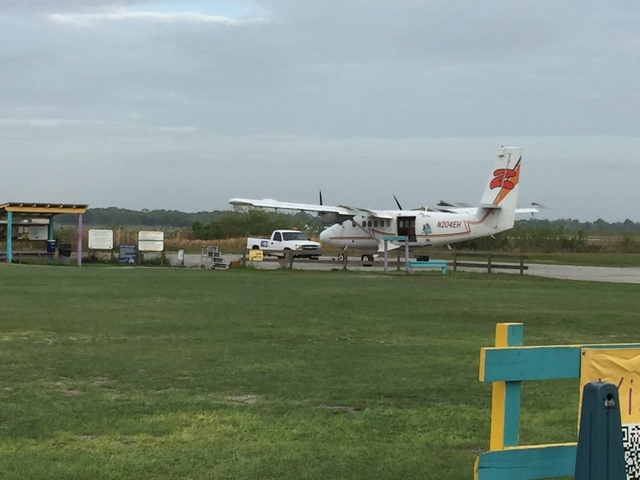 We went to City Skydive to jump out of a plane with a parachute made with our very own Carlson Plotter/Cutter. Unfortunately this is as close as we got. Grey skies left the planes grounded. Looks like we’ll have to go when we come back to install their second PT-78 Team Work system! We would like to give a big thanks to Mike, Jim, Marci, Chuck, and Felix for all of their help making this a very fun, and successful install in Orlando, Fl. We can’t wait to see what they do for the NEXT 20 years!